​WE HOPE YOU CAN JOIN US on TWITTER for our #NGSSslowchat USING THIS BOOK! Slow chats on Twitter allow for personalized learning and great conversations on demand. Slow chats utilized a hashtag on Twitter. 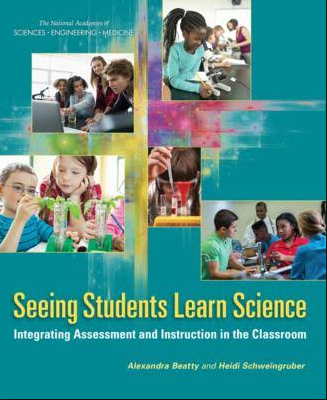 Our hashtag for this book study is #NGSSslowchat and our chosen book is Seeing Students Learn Science. A question will be tweeted to the hashtag #NGSSslowchat each day, Monday through Thursday over a period of six weeks. Each week will focus on 1 of five sections of the book (the first section is spread over 2 weeks). The chat will run from Oct 2 through Nov 10, 2017. More information and schedule below. Week of Oct 16: What Does This Kind of Assessment Look Like? pages 33-47. Week of Oct 23: What Does This Kind of Assessment Look Like? pages 47-50 and What Can I Learn from My Students'Work? pages 51-69. Each day, Monday through Thursday, a new question will be tweeted to the #NGSSchatslow hashtag. Participants are encouraged to reflect on their reading and respond to the question. Participants are also encouraged to join the asynchronous conversation and respond to the tweets of other participants. Question 2 - Please read page 5 "A New Way to Think About Science Learning" & tweet an idea that resonates w/ you + why? Question 3 - On pages 6-10 the book describes the importance of integrating the 3 dimensions in the classroom. What have been your biggest challenges to creating 3 dimensional assessment? Question 4 - How do you collect evidence about how students are progressing along the pathway that ultimately leads to proficiency of a performance expectation?How do you document and gather information about a student’s developing capacity to integrate the three dimensions of science learning? Friday - No new questions on Friday. If you have not done so yet, you are encouraged to engage other people on the hashtag and have discussions about ideas they have shared related to the questions posted. Question 5 - Using the table on page 15 as a ref, which of the changes in classroom practice was the most significant in your teaching from pre-ngss to post-ngss? Where did you find support/resources to make this change? Question 6 - After reading the four bullet points on pages 18-19 under the heading “A New Way to Think About Assessment,” please share which of those 3D assessment criteria is the most challenging for you and why? Question 7 - After reading the teal headings on 22, 23, 24 under the heading “What will be different,” Please share one that is an area of focus in your classroom and give an example of the work you have done so far in that area. Question 8 - Pages 26-31 are jam packed of info about the purposes of assessments, what are your aha moments or what portion(s) really resonated with you on those pages? Question 9 - Chapter 2 presents a 3 dimensional assessment task on page 35 called “solving the mystery,” page 37 adds a rubric, can you find evidence of all 3 dimensions in this rubric? If yes, please cite some examples. If anything is missing indicate what you would add. Question 10 - Pages 38-45 show a traditional example of assessment and a 3 dimensional approach, pages 46-top of 48 discusses the differences. What stands out about the differences? Question 11 - Ch 2 contained multiple examples of NGSS 3D assessments + advocated for multiple assessment opportunities to collect a “body of evidence” to capture students progress towards a PE. How do you manage this data collection? What do you “grade?” How do you communicate progress with Students and Parents? Question 13 - Ch 3 pg 52-56 Opens with a class scenario about iar that was used in multiple ways to elicit and analyze student thinking. Share how the teacher determine what students were learning.